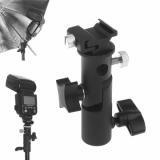 Flash Universal Bracket is designed for shutterbugs. It adopts durable material to ensure long service time. Just take it. Flash Universal Bracket, which is an excellent gift for shutterbugs, comes with tighten connection with flash to increase safety. In addition, it has hole for anti light umbrella or parachute and 180-degree adjustable angle to bring convenience. High quality material ensures long service time. Just take it to take attractive photos. Does exactly what I need. Very strong metal brackets. You won't accidently bend these. One VERY IMPORTANT note: To pull the screws out of the bracket you have to slide the screw to the end of the slot. The far end of the slot is just slightly wider enabling you to remove the screw completely from the bracket. This Flash swivel is so well made with thick and sturdy aluminum and with smooth sliding ability. The tilting bracket is made of plastic but is very thick and is also very sturdy. For the price I paid it is well worth it and I am happy that I found this offer. If you are a dope like me, it will take a while to figure out that the thumb screws only screw through the slot at the very end of the slots (to keep them from falling out). Once that is behind you, these work well and are a good value for the price. No instructions come in the box. Well built, quite a bargain for the price. Very satisfied. Great bracket to get my lights pointed further down without a boom stand. Provides the flexibility I was looking for to use both an external flash and wireless remote control at the same time during a sitting. 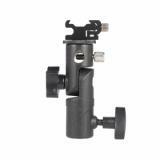 Also offers multiple configurations for offsetting angles and seems heavy enough to support a larger external flash. can't tell you how many different ways I have used these things since I bought them. I do some medical photography and find myself having to make some very unique gimble-like contraptions to get just the right shot. These brackets are good and do exactly what they advertise. The metal threads could be stronger, I think with enough usage they'll strip, probably quicker than a higher grade metal, but for the price I'm very pleased. 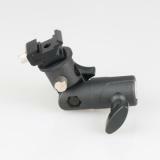 Solid metal construction and smooth threads ensure hassle free attaching. 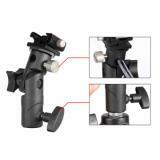 Very nice quality to ensure that your flash and/or accessories remain in place without worry. Great fit, nice and sturdy. Not a whole lot to say; they simply work and don't feel cheap at all.